Acupuncture is quickly becoming a household name, as more and more people are looking to complementary medicine to fill in the cracks of modern western treatment. What many people don’t know is that acupuncture is only one branch of the Traditional Chinese Medicine (TCM) tree. Licensed acupuncturists are also trained in qi gong exercise, eastern dietary therapy, and tui na (a Chinese method of soft tissue massage and joint mobilization). Some acupuncturists also go through a rigorous academic program to become trained in the fifth branch, which is Chinese herbal medicine. These internal medicinals are extremely safe and effective when prescribed by an acupuncturist with graduate level training, and can be used in combination with or in place of acupuncture to treat an incredible range of conditions. Since Chinese herbal medicine differs from the western way of approaching the use of medicinal herbs, here are some topics that often come up around Chinese herbal medicine in our practice. A clinician who is trained in Chinese herbal medicine is equipped with extensive training on around 500 different herbal medicinals, and we very rarely use each herb individually. The magic is in the thoughtful combination of several different herbs to achieve a therapeutic effect; the herbs work synergistically to treat the patient’s root condition as well as the symptoms that brought them into the clinic. Since the herbs are used in combination, we can use them to balance each other and cancel out any potential side effects. As with all things in Chinese medicine, we treat the individual. When two people experiencing (for example) migraine headaches come into our clinic, chances are good that they have two totally different “patterns,” or underlying causes that are creating headaches. We would give them very different combinations of herbs, each of which we would alter as the condition changed or improved. Since there is not a one-size-fits-all prescription, we can’t send people to the store to pick up the herbs themselves. We create the combination and send our order to one of two dispensaries that are run by people who we know and trust to be accurate and diligent with the orders they fill. The herbs are then sent to the patient’s house directly, or to our clinic where they can be picked up. Different patients have different needs, right down to the way they take their herbs. We try to be flexible and provide several methods for administering herbs to our patients. The first way, and arguably the strongest way, is to take raw herbs. By this method, you are given a bag of leaves, stems, flowers, etc which are then boiled on the stove for about an hour. The liquid is separated, set aside, and and consumed over a one to two day period. The second way is to take the herbs as a powder. The process described above is done for you, and the liquid is combined with potato starch to create a powder that you can mix with liquid and drink twice per day. I generally prefer this method since it can be individualized and is convenient for patients with a busy schedule. We also have the option of prescribing internal medicinals in pill form. By this method we use a classic combination of herbs that is not individualized to the patient, but can still be extremely effective and is very convenient. These pills are usually combinations that were created by Chinese doctors before the discovery of modern western medicine, and have stood the test of time. Finally, we are well versed in the treatment of traumatic injury, whether it’s surgical or from injury. Chinese herbs can be administered topically to promote healing and decrease inflammation. We have a variety of salves, poultices, and even soaks that can help get you back on your feet faster. You don’t need to choose between your MD and “alternative” doctors. Modern bio-medicine works amazingly well hand-in-hand with TCM. 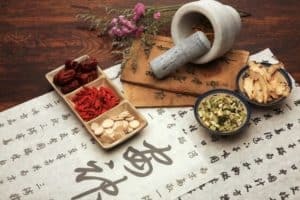 Studies are now showing that patients who are treated with the combination of western medicine and TCM get better faster than patients who use either method exclusively. These patients are able to take much lower doses of prescription drugs and experience very few side effects. Interested in Chinese herbal medicine? We provide herbal consultations to our acupuncture patients at no extra cost. Not interested in acupuncture? Call us to schedule your consultation for Chinese herbal medicine. I would love to answer any more questions you have! Post on our Facebook page or email pivotacu@gmail.com.